Want to make a soup, but don’t want to go out and buy the stock from the grocers store that is loaded with things you can’t pronounce, not to mention the salt? Take a day and make your own stock. It is so easy, the stove does all the work, and you get all the rewards. 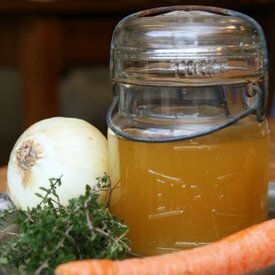 You can make Vegetable Stock, Beef Stock, Chicken Stock, whatever kind of stock you can think of. Don’t throw away your peelings when you prepare your meals, instead, wash them and freeze them for when you are ready to make stock. I call it “Garbage Soup” because I use all of the vegetable, even the parts people throw away. I must say the green tops of a carrot do add a salty taste, so take it easy on them. I must confess to not always eating my greens that come in my box. They are usually tucked away in the freezer for stock day though, and chopped in chunks, make a wonderful addition to the pot. When making a meat stock use scraps or tough cuts of beef or lamb, or a carcass from a roast of chicken or turkey you just enjoyed. I like to brown the meat for added colour, so roasting the meat is the easiest, 350 degrees for 1 hour seems to work well. I like to use meat that has bone in it, because the bone provides extra sustenance. Roast the meat uncovered and without the veggies, then after the hour is up, put the roasting pan or dutch-oven you are using on top of the stove with the veggies thrown in, roughly chopped and not peeled and a top-up of water, bring to a boil, and reduce to low. Cook for one hour. Let it cool a bit. Strain through a strainer into jars and you are done. I have a friend who strains hers for at least 5 times just to get all the bits out, but I love the bits, so I keep them. Vegetable Stock is even simpler. Don’t bother to peel your veggies, just roughly chop them in quarters. Top up the pot with fresh water. Toss in a handful of pepper corns, a few bay leaves, any and all herbs from your garden like thyme, oregano, parsley and lovage for instance, bring to a boil and simmer for an hour or so. Let cool and then strain into jars. Roasted Root Stock is amazing in the fall and winter. Just throw what ever root vegetables you have, carrots, parsnip, turnip, beets, in a roasting pan with lots of onions and a bit of olive oil. Roast for 1 hour. Pour water over vegetables and bring to a boil on top of the stove and simmer again for perhaps an hour with some added herbs like rosemary and thyme. This stock has a real depth to it. Stock can go a long way when making soups, sauces, gravies, any where you need a liquid in a recipe. I have even used it when making my bread instead of water. Any veg will do. Put jars in the freezer for future use or use right away. Give it a try. This entry was posted in Uncategorized and tagged Sauces, Soup, Stock, Veggie Vivers. Bookmark the permalink.